I’ve been wanting to do this for a long time. 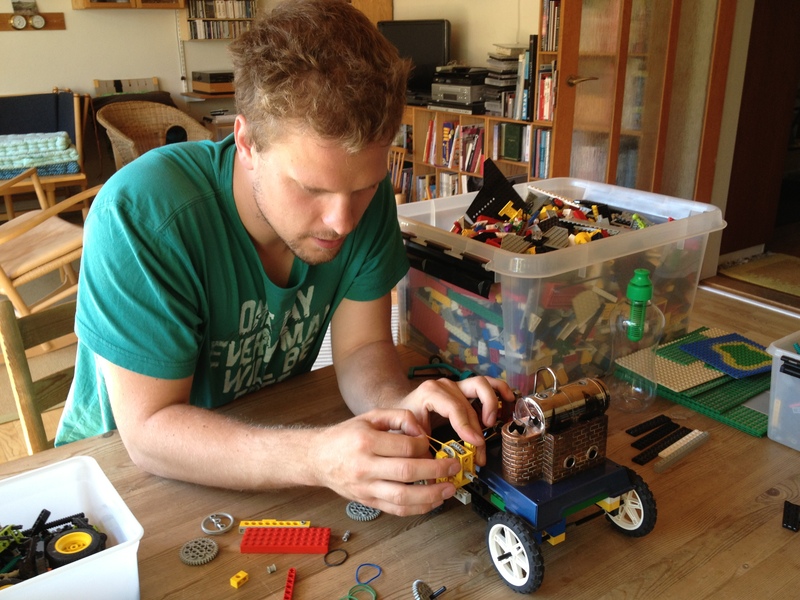 Therefore Fathers Day seemed to me as the perfect excuse to build a steam-powered LEGO vehicle. The team consisted of my brother, my son and of course, my dad. Why? To have fun and learn at the same time! My beautiful Wilesco D6 steam engine and my beautiful son. But first I had to find my old Wilesco D6 miniature Steam Engine. This little machine is a real working steam engine that looks just like they did 150 years ago. You put water in the kettle, a fuel tablet underneath, light it up and wait. The stamp will start to move after 15 or so mins. Finally the big wheel will start spinning, and soon at a very high speed. Now you can use the power from the machine to anything you like. 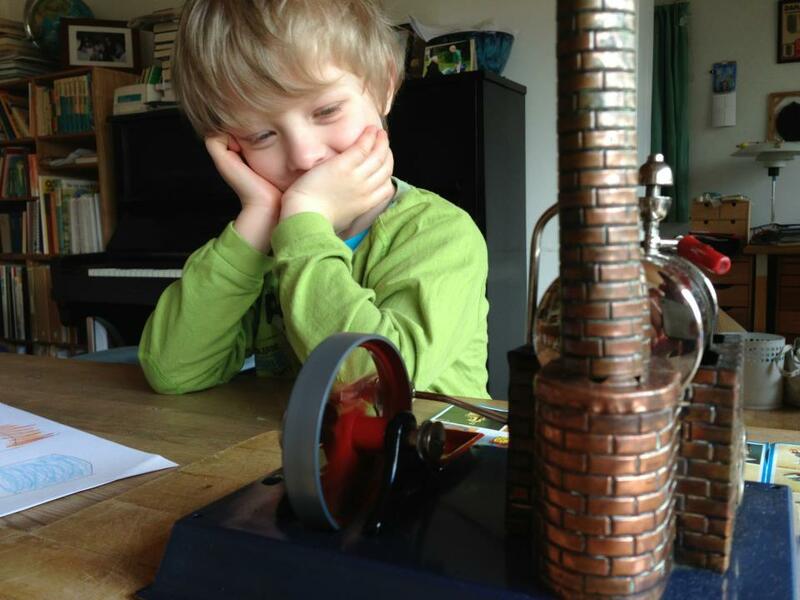 My idea was to show my 5-yr old son how a steam engine works in a visual way. I thought building a moving object would be ideal for that. I knew that the engine would vibrate heavily when fired up, therefore the engine must be fastened to the gears, platform and wheels if I wanted it to work reliably. Also I had this idea, that the gearing should be very low, since the steam engine would spin very fast, but quickly loose momentum after 5 or 6 minutes, only to regain it some minutes later. Working with gears doesn’t have to be that complex. Just remember this simple rule when going from one gear to another: small to big = lower gearing, big to small = higher gearing. 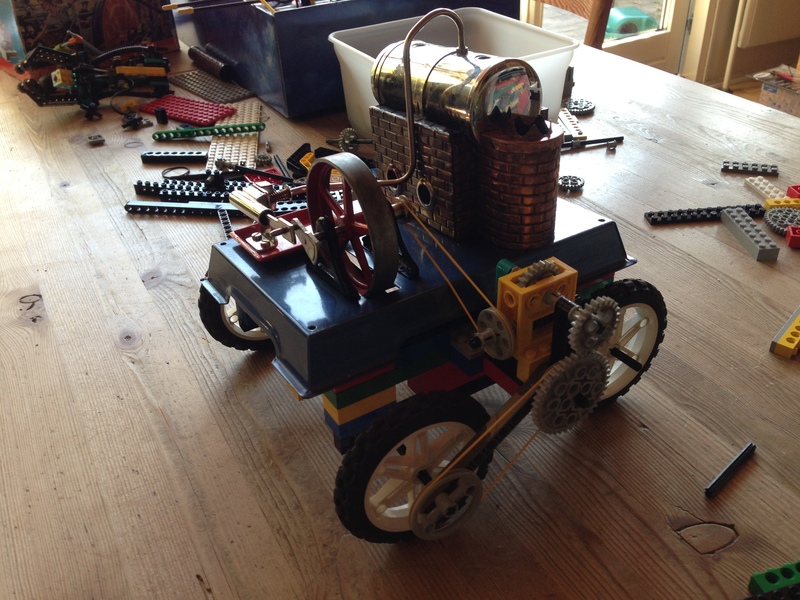 The LEGO Steam vehicle is ready for testing! Maybe my next project should be a solar LEGO air fan/robot/something like that?